BACKGROUND AND PURPOSE: Several white matter tracts in the brain cannot be identified on MR studies because they are indistinguishable from the surrounding white matter. We sought to develop a method to precisely localize white matter tracts by correlating anatomic dissections with corresponding MR images. METHODS: MR imaging was used to guide anatomic dissection of the uncinate fasciculus. Formalin-preserved brains were imaged before and after several stages of dissection. Progressive dissection was guided by using volume-rendered and cross-sectional images of the dissected specimens. To precisely define the location of a tract, its surface was traced on the corresponding three-dimensional MR image of the dissected specimen. MR images of the dissected and intact specimens were coregistered to allow the tracings to be projected onto multiplanar reformatted images of the intact specimen. CONCLUSION: MR-assisted anatomic dissection permits limited removal of brain tissue so that important anatomic and surgical relationships can be demonstrated on correlated MR studies. This method can be applied to other white matter tracts that are indistinguishable on MR studies and to situations in which anatomic validation of normal and abnormal diffusion tractographic studies is needed. MR imaging of the brain has been particularly effective in demonstrating normal and abnormal white matter of the brain. A number of white matter tracts have been described in the MR literature. However, several white matter tracts in the brain cannot be identified on MR studies because they are indistinguishable from the surrounding white matter. To localize white matter tracts on MR images, we needed to develop a dissection method that allowed the preservation of important structural relationships; that is, a method that permitted dissection with minimal removal of brain tissue. This is in distinction to previously described techniques for white matter dissection in which adjacent tissue was removed to demonstrate the dissected tracts. Destruction of adjacent tissue hinders identification on MR cross-sectional images. The goal of this study was to develop anatomic dissection tractography; this method allows the precise localization of these tracts by correlating anatomic dissections with corresponding MR images. Review of the literature demonstrated no previous studies correlating the anatomy and MR images of dissected white matter tracts. The new technique we describe is referred to as anatomic dissection tractography and consists of two methods: MR-assisted anatomic dissection and coregistration of intact and dissected specimens. Together, these enable the anatomic definition of white matter tracts with respect to the intact MR anatomy. The uncinate fasciculus was chosen to assess these methods. Four adult human brain specimens were examined by means of MR imaging and dissection. The specimens consisted of sagittally sectioned halves of the brain that were preserved in formalin. Two specimens were dissected in the conventional manner, and the other two were dissected by using MR imaging assistance. These specimens were imaged before and after several stages of dissection. Imaging was performed on a 1.5-T MR unit. The specimens were immersed in distilled and deionized water in a plastic container placed in a 28-cm transmit-receive coil. The specimens were imaged in the sagittal plane by using a T1-weighted spoiled gradient recalled–echo sequence. The following parameters were selected to provide nearly isotropic voxels of 0.625 × 0.625 × 0.7 mm: TR/TE/NEX of 25/7/2, flip angle of 45°, matrix size of 256 × 256, field of view of 16 cm, and section thickness of 0.7 mm. A total of 124 sections were obtained in 28 minutes. Data obtained were used to generate three-dimensional (3D) MR reconstructions and cross-sectional MR images during the stages of the dissection (as described later). 3D MR renderings of the brains and reformatted images in the sagittal, axial, coronal, and oblique planes were generated on a workstation. A cross-sectional MR image could be generated at the cursor site by placing the cursor on the 3D model of the brain. On some images, air bubbles in the temporal horn created magnetic susceptibility artifacts (represented as signal voids) in the adjacent brain tissue. To prepare for the dissections of the uncinate fasciculus, we consulted previous anatomic studies (1–12). The method of dissection in this study consisted of limited removal of brain tissue so that structural relationships in the anterior temporal lobe and in the external and extreme capsules in the insula could be demonstrated on the MR images. Only the lateral surface of the white matter tracts was exposed by dissection. A method was developed to allow for the precise staged dissection of the white matter tract. This consisted of creating 3D MR reconstructions and reformatted cross-sectional MR images of the specimen, before and after several stages of dissection, to assist with further dissection. This allowed the identification of structures at the edge of a particular dissection stage on cross-sectional axial, coronal, and sagittal images. With the aid of these MR studies, the surface of the uncinate fasciculus was identified and successfully dissected. The first step in translating the precise location of a white matter tract consisted of tracing the dissected surface of a tract onto a corresponding 3D rendering (13). The MR image of the intact specimen before dissection was coregistered with the MR image of the dissected specimen. With the tract tracing now coregistered to the predissected specimen, the precise location of the surface of the tract could be shown on multiplanar cross-sectional reformatted images. This method could be used to delineate several dissected tracts in the same specimen. To achieve these results, one needs to rigidly register the image of the dissected brain with the intact brain (and with an intermediate stage of dissection). Because these brains were excised, the brain surface was exposed and easily determined by using a simple threshold. The distance between brain surfaces was then used as a criterion for registration (14, 15). Although the surfaces differed at the location of the dissection, outlier rejection (a fixed penalty for large distances representing obvious mismatches) effectively ignored this relatively small area for the purposes of registration. Because the brains were virtually identical, except for the dissected region, the resulting rigid registration was of high quality. Once the rigid transformation matrix was determined, the images were re-sectioned into the space of the dissected brain. The dissected brain was volume rendered, and the location of the surface of the dissected white matter tract was visually identified. The dissected specimen was available for reference. The visible extent of the white matter structure was manually traced and filled in; this represented the lateral margin of the region dissected. Because the images were registered, this region was then available for color-coded overlay on volume renderings of the dissected brains or on reformatted cross-sectional views of the dissected or intact brains. The flowchart in Figure 1 summarizes the methods of this investigation. Flowchart summarizes the stages of dissection tractography, which involves two methods: MR-assisted dissection and depiction of dissected tracts on MR images. In the first stage, MR imaging during the initial dissection helps prevent damage to the tracts under scrutiny. In the second stage, coregistration of 3D MR images of the specimen before and after the completion of dissection allows for the coregistration of a traced, dissected tract and the intact specimen. This in turn allows the creation of cross-sectional MR images with the traced white matter tract superimposed (Fig 4). In all specimens, the initial stage of dissection was performed without the MR-assisted technique. Initially, the white matter of the superior temporal gyrus and the temporal pole was isolated by progressive removal of the gray matter (Fig 2A). With further dissection, the white matter of the anterior segment of the middle temporal gyrus was isolated by progressive removal of the gray matter (Fig 2B). To visualize the insular gyri covered by the braches of the middle cerebral artery, the superior temporal gyrus and part of the middle temporal gyrus were removed by dissection (Fig 2C). This was followed by removal of the insular branches (M2) of the middle cerebral artery, leaving its horizontal segment (M1) as a landmark. Photographs of the lateral surface of a cerebral hemisphere show stages in the dissection of the temporal lobe. A, Initially, the white matter of the anterior part of superior temporal gyrus (small arrow) and temporal lobe pole (large arrow) was isolated by progressive removal of the gray matter. 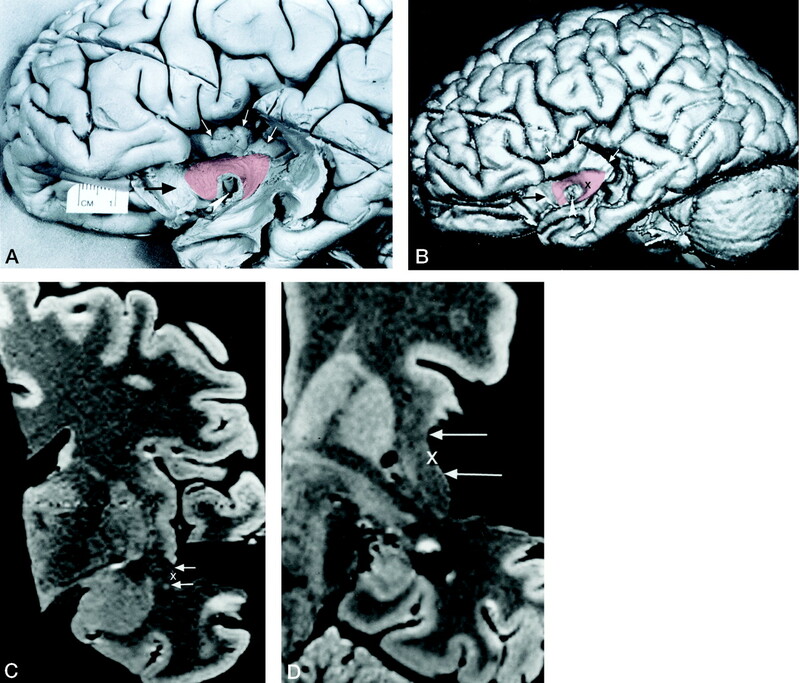 B, With further dissection, the white matter of the anterior segment of the middle temporal gyrus (arrows) was isolated by progressive removal of the gray matter. C, To visualize the insular gyri (small white arrows) covered by the middle cerebral artery (arrowhead) and its insular branches, the white matter of the anterior segment of the superior temporal gyrus was completely removed by dissection. A portion of the white matter of the middle temporal gyrus (black arrows) was also removed by dissection. The inferior temporal gyrus (large white arrow) was left intact. In the initial two specimens dissected without the aid of MR imaging, deeper dissection was not successful. In both specimens, dissection of the white matter deep to the insular cortex resulted in the uncinate fasciculus not being identified until it was cut through or partially removed. Because the uncinate fasciculus is difficult to distinguish from surrounding white matter and because it is located only millimeters below the insular cortex, it was easy to cut through by error. Additionally, too much of the surrounding brain was removed in searching for the uncinate fasciculus. Deeper dissections in the third and fourth specimens were guided with 3D MR renderings and reformatted cross-sectional MR images of the specimen after each stage of dissection. This approach allowed us to identify structures at the edge of a particular dissection stage. The dissection was stopped after each 1 or 2 mm of deeper dissection, and the position of the dissection verified by obtaining MR images of the dissected specimen and by generating a 3D MR rendering and cross-sectional images. 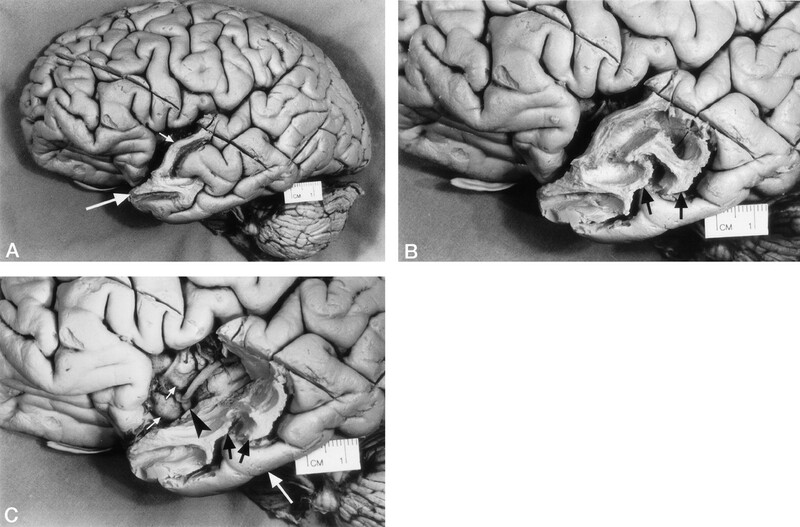 With these serial MR studies, the dissection progressively approached and entered the extreme capsule, and a segment of the surface of the uncinate fasciculus was identified (Fig 3). These methods were successful in the dissection and MR identification of the surface of two additional tracts (16). Method used to identify the location of the dissected surface of the uncinate fasciculus on reformatted cross-sectional MR images. A, Photograph of the lateral surface of the dissected brain specimen. Branches of the middle cerebral artery have been dissected away, leaving the horizontal segment (M1) of the middle cerebral artery as a landmark (arrowhead). The lower part of the cortex of the insular gyri (white arrows) and the posterior orbital gyrus (black arrow) have also been removed by dissection. A segment of the surface of the uncinate fasciculus (transparent red) is visible and courses from the temporal lobe into the white matter of the insula. It passes anteriorly around the middle cerebral artery and into the posterior orbital gyrus. To demonstrate the underlying dissected uncinate fasciculus, we used a 10% transparent red that results in a pink appearance. B, 3D MR rendering of the dissected specimen in A demonstrates the accurate surface anatomy that can be depicted in this way. A segment of the surface of the uncinate fasciculus is color coded transparent red. The middle cerebral artery (arrowhead), the cortex of the insular gyri (white arrows), and the posterior orbital gyrus (black arrow) can be identified. C and D, Coronal (C) and axial (D) reformatted cross-sectional MR images show the location of the dissected segment of the surface of the uncinate fasciculus (arrows). These cross-sectional images were generated at a level indicated by a cursor (X) placed on the surface of the uncinate fasciculus on the 3D MR rendering in B. The position of the cursor on the cross-sectional images indicates the surface of the uncinate fasciculus. Coregistration of the cursor permitted comparison of localization on the dissected surface with corresponding coronal and axial MR images. Using the methodology described above, we precisely localized the position of the tract on the multiplanar reformatted MR images of the specimen before dissection. The intact specimen was imaged with a 3D volume MR imaging sequence and a 3D rendering was produced (Fig 4A). The same specimen was dissected and imaged again. A new 3D rendering was generated (Fig 4B),and the surface of the uncinate fasciculus was traced on it and color coded (Fig 4C). A cross-sectional image (Fig 4D) was generated by using the 3D tracing in Figure 2C and the MR image of the dissected specimen. The MR image of the intact specimen was coregistered with the MR image of the dissected specimen, bringing both specimens and the traced uncinate fasciculus into the same coordinate space. Then, a complete cross-sectional image with the color-coded tract was generated (Fig 4E) by using the coregistered MR image of the intact specimen. 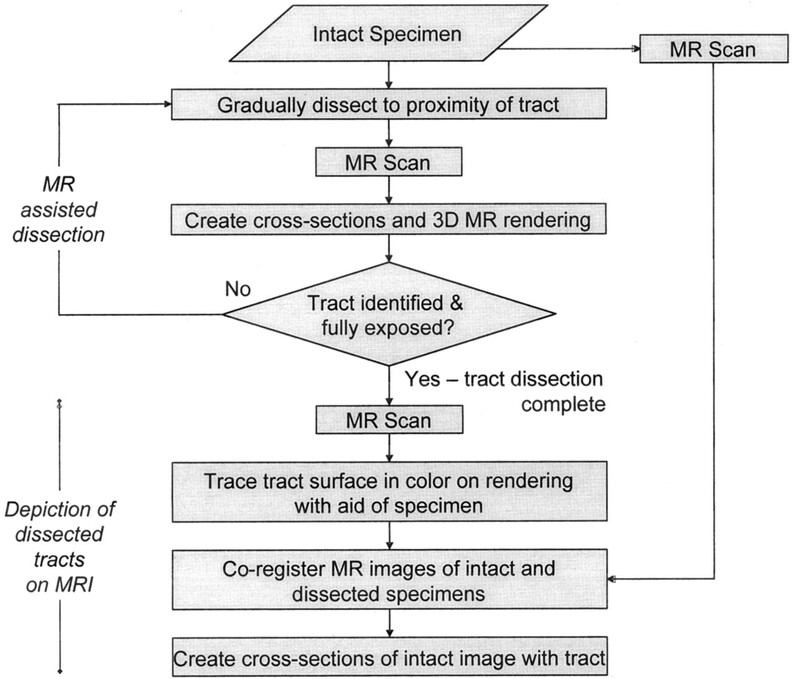 Method for MR localization of the dissected surface of the uncinate fasciculus on a 3D MR rendering and on multiplanar reformatted MR images of the specimen before dissection. A, 3D MR rendering shows the undissected lateral surface of the brain. B, 3D MR rendering shows the dissected lateral surface of the brain. C, 3D MR rendering with the surface of the dissected segment of the uncinate fasciculus traced and color-coded red. D, Coronal reformatted cross-sectional MR image of the dissected specimen in C shows the location of the dissected segment of the surface of the uncinate fasciculus in red. E, Coronal reformatted cross-sectional MR image of the coregistered undissected specimen shows the color-coded tracing from D. This resulted in the identification of the precise MR location of the tract on the multiplanar reformatted images of the undissected specimen. In summary, these techniques enabled visualization of the dissected tract without destroying the adjacent tissue and allowed its precise localization on cross-sectional MR images. Localizing white matter tracts that are indistinguishable from the surrounding white matter on cross-sectional MR images can be challenging and prone to errors. Because these white matter tracts lack identifying features on MR images, standard anatomic studies have somewhat limited usefulness to neuroscientists who require precise knowledge of the structural relationships on MR images. During the last century, a number of methods have been developed to visualize white matter tracts by using histologic techniques (eg, myelin staining) and using active axonal transport of injected tracers (eg, radioactively labeled proteins, horseradish peroxidase, fluorescent dyes). These microscopic methods are not suitable for correlative anatomic, MR imaging, and clinical studies. Diffusion-tensor MR imaging of white matter is used to measure local fiber orientation in vivo, and tracts are traced by following the local directions of greatest water diffusion. Diffusion-tensor imaging of fiber tracts may benefit from the anatomic definition of the tracts on MR images obtained with our method. Our goal was to establish methods for delineating the anatomy of dissected white matter tracts on cross-sectional MR images. To achieve this, the technique of MR-assisted anatomic dissection was developed first. This technique allowed the visualization of the uncinate fasciculus in minimally dissected specimens. The second innovation of this study was the coregistration of 3D MR images of the dissected and undissected specimens. This permitted accurate localization of the dissected white matter tracts on cross-sectional MR images. To our knowledge, this method of precise localization of white matter tracts on MR images has not been described in the literature. The type of dissection necessary for MR imaging localization required deviation from past dissection methods. Limited removal of brain tissue is crucial to permit the demonstration of important structural relationships on the anatomic specimens and corresponding MR images. Prior anatomic studies (2, 4–6) demonstrate the uncinate fasciculus in isolation, with all of the adjacent structures removed. These types of dissections were not useful for the aim of this investigation. The corpus callosum, the anterior commissure, the corticospinal tract and other similar tracts are composed of tight fiber bundles coursing in the same direction and making them distinct on MR images. The fibers of the uncinate fasciculus and certain other white matter tracts are intermingled with other fibers that course in various directions (2, 17). This may explain why they are not distinct on MR studies. Dissection of the intermingled white matter tracts is a difficult task. Their fibers are submillimeter in size and not easily distinguished from the surrounding white matter. A dissection can be ruined by cutting through the tract one is searching for before one realizes it. Curran (2) stated that he wasted a large number of specimens before he learned how to produce a successful dissection of white matter tracts. In the current era, when specimens for dissection are not readily available, it is advantageous to use a technique that permits successful dissection without many ruined dissections. Before our method was developed, several specimens had to be discarded after prolonged dissection efforts because the tract was mistakenly cut through. After our MR-assisted technique was perfected, a successful dissection of a white matter tract was performed on a single specimen. MR-assisted dissection proved invaluable in identifying the expected location of the uncinate fasciculus. Once dissection proceeded to the expected location of these tracts, the fibers were identified and carefully dissected from the adjacent tissue. This permitted the selective removal of brain tissue so that anatomically and surgically important structural relationships could be maintained and demonstrated on the MR images. A demonstration of the entire tract and its surfaces entails removal of all adjacent tissue. The extensive removal of surrounding brain tissue eliminates all adjacent landmarks, and the corresponding MR images would have little structural and diagnostic value. Although only the lateral surface is exposed with the current technique of dissection, determining the MR location of the deep surface of most of the dissected tract is straightforward because the adjacent deep structures are recognizable. Other dissection techniques were considered for use in this study. These included a freezing technique (5, 6, 11, 18–20) consisting of several freezing and thawing stages of formalin-fixed brain. As water increases 10% in volume with the formation of ice, freezing results in some separation of the fiber tracts, facilitating the dissection (18). In evaluating this technique, we found that the freezing and thawing stages resulted in fissures in the brain tissue, as shown on MR images. Because of this image degradation, we decided not to use this technique for this correlative anatomic–MR imaging investigation. The MR images generated with the parameters used in this investigation displayed exquisite anatomic detail, the type of detail not typically available on images of fresh, not formalin-fixed, brain specimens. Prolonged immersion of the specimens in formalin likely accentuates the distinction between gray matter and white matter. Of note is the reversal of gray matter and white matter contrast on the MR images in this study. The contrast reversal of gray matter and white matter on T1-weighted images of formalin-fixed brain specimens has been attributed to a greater decrease in T1 relaxation time in gray matter than in white matter (21). A possible explanation for this phenomenon is damage to the myelin phospholipid structure by formalin. This damage counteracts the overall reduction of T1 relaxation time in formalin-fixed gray matter and white matter. Another consequence of the formalin fixation of the brain specimens was the inability to perform diffusion-tensor imaging of the dissected specimen. Diffusion imaging would have been a useful addition to this investigation. However, several attempts at obtaining diffusion-weighted MR images were unsuccessful; this was most likely the result of formalin fixation. The techniques developed during this study should be widely applicable for investigations of white matter tracts throughout the brain. The surgical and sectional MR anatomies of a number of white tracts are not well known. Despite the valuable and precise information provided by histologic studies (1, 3), there is a need to visualize the dissected anatomy of the tracts. Dissections are of great value because they confer a topographic understanding of the relationships of the various structures in the region of the tracts, as Rasmussen pointed it out in regard to the optic radiation (17). The combination of dissection with coregistration of the intact specimen permitted precise localization of these important white matter tracts on cross-sectional MR images. Dissection of white matter tracts by use of 3D and multiplanar reformatted MR techniques in formalin-preserved brain specimens is useful for delineating complex white matter anatomy. It permits the selective and limited removal of brain tissue. Coregistration of the 3D MR images of dissected and undissected specimens identifies the precise location of the dissected white matter tracts on cross-sectional MR images. As a result, anatomically and surgically important structural relationships can be demonstrated on the MR images. Demonstrating the normal MR anatomy of these tracts in various planes provides the knowledge necessary to document their involvement on MR studies. The precise MR localization of white matter tracts is important in presurgical planning and in understanding disease propagation. It also provides a solid anatomic basis for in vivo studies of white matter tracts with diffusion-tensor MR imaging. Accepted after revision October 30, 2003.